First things first, and anyone who knows me can attest to the fact that I’ve always said that Black Thought’s achilles heel as a MC is, he’s not a story teller. I mean, if you want him to rhyme about a chick (Silent Treatment, You Got Me, Break You Off) he can do that but for the most part, Thought is just a spitter. Which isn’t a bad thing but it’s why he’ll never even come close to making my top 10 list cause to me, to be a dope MC, you gotta be able to tell a story and Thought doesn’t do that for me. So, hearing that “Undun” is gonna be a concept album…actually makes me care even less about it. But who knows, maybe Thought (and a GANG of other MC’s…I guess The Roots albums are basically Money Making Jam Boy albums now) will prove me wrong this go round. Well, after listening to “Undun” several times, forwards, backwards and forward again…I just don’t get it. If it weren’t for the pre-release hoopla of interviews, videos and press releases about this being a concept album, I’d have absolutely NO idea that this album is telling a story. And for anyone who had no idea that this was a concept album prior to listening to “Undun” and after listening, can tell me EXACTLY what it was about and how it tells a story backwards and can HONESTLY say that they got it…then they’re the 2012 Doggie Howser. As a concept album “Undun” fails horribly. To have 5+ guests on this album but there’s no interaction between any of the MC’s makes no sense to me. If you’re gonna tell a story, tell a story. Is Thought playing the fictional character Redford Steven? I’d have to assume so. But then who are the other MC’s? Is Phonte Redford’s friend? If so can we hear a convo between the two? Not, you lay your verse and I lay mine like this is a regular album but on some back and forth EPMD type interaction to help, God forbid I don’t know…tell a story! Who’s P.O.R.N. in the storyline? Who’s Truck North? Who’s Big K.R.I.T.? And why the hell does someone keep letting Dice Raw sing the f-cking hooks?!?!??! Now I KNOW there will be die hard Roots stans who will listen and dissect this and make up 1,000,000 different philosophies on who’s who and what’s going on and they’ll probably all be wrong but for me, when did storytelling become so deep? Isn’t telling a story suppose to be simple? I didn’t need a press release from Common and 3 videos telling me that he was making a song about hip hop but comparing it to a girl for me to get “I Used To Love H.E.R.” Nas didn’t need to tweet to his 1,000,000 followers to give us the heads up that he was writing a song from the standpoint of a gun. Nope, you just pressed play and you heard it and you got it. Well I don’t get that from “Undun”…at all. Now, even though this album fails horribly on the concept front, I still gotta take sec and sit back and just peep the music and not judge it as a concept album and this is where “Undun” actually doesn’t disappoint. 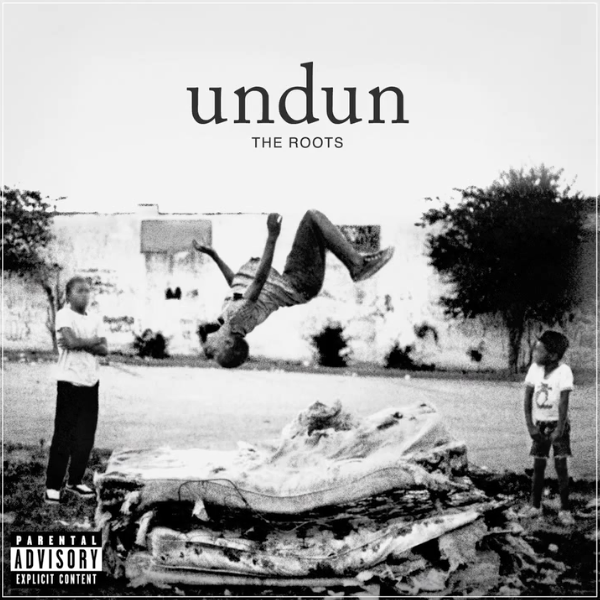 The dopest thing about “Undun” for me is that the bulk of the drums backing all the songs have a break beat feel to them which equals that boom bap sound I’ve been begging The Roots to go back to since the “Things Fall Apart” days. “Tip The Scale” featuring Dice Raw is an ill banger that has Dice coming with one of the illest lines I’ve heard in a minute, “I got a brother on the run and one in/wrote me a letter he said when you coming?” “Lighthouse” and “I Remember” are both dope and between “Kool On” featuring Truck North and P.OR.N. , “The Other Side” featuring P.O.R.N. and Bilal and the Sean C. & L.V, produced “Stomp” featuring P.O.R.N. and Just Blaze obviously has P.OR.N.’s not only coming for the title of the nicest MC in the Money Making Jam Boys but that he EASILY needs to be Malik B’s long lost replacement cause he balances Thought out perfectly and they have the best chemistry of all of the guest MC’s the Roots have featured (and there’s been A LOT) since Malik left the group. But my favorite song on the album is “One Time” that has Phonte absolutely stealing the show (not just on this song but the whole album) with lines like “the spirit in the sky screaming homicide/but it was time to ride/on some n-ggaz funny talking/it too much money talking/we make ‘em economize/real rap, no tale spinning, such is the life of a kam-I ka-ze pilot/we wyling out of control, until we all make the funny papers like comic con/feared in all streets so, if you ever see me out in ya’ll streets/find another one to occupy.” So even though “Undun” falls short on the storytelling front of Redford Steven’s life, you at least get some dope music as a consolation prize.